X-Small (3T-4T) - $39.99 Only 1 left! Put the neighborhood on notice. Because there's a new princess on patrol. She's got sharp aim with an arrow, and she's ready to let everyone know that she's going to make her own destiny. And this princess is going to be your girl, right in your own home! 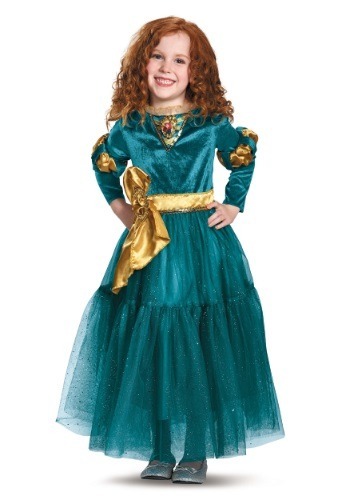 At least it will be when you get your child this Deluxe Merida costume. It's the signature details that really bring this Disney look to life. The all polyester velvet dress is elegant and princess-like in a beautiful teal accented with golden ribbon and embellishments. A sparkly glittered tulle overlay is attached to the skirt to bring the character to life, and the attached Merida cameo jewelry piece will give any little one official regal status as the VIP Disney Princess from the hit animated flick. When she has big dreams, the best bet is to get her started early. With this costume, the dreams are sure to get a little bigger! This detailed costume is officially licensed and brings all of the animated styling cues that we know and love from the Brave into reality. Complete her look with a licensed red wig, and she'll be ready to grab her arrow and start shootin away. After all "Our fate lives within us... You only have to be brave enough to see it!"